A fantastic quote from Canadian public intellectual Marshall McLuhan prefaces Josh Kriegman and Elyse Steinberg’s absorbing campaign documentary Weiner. “The name of a man,” he asserts, “is a numbing blow from which he never recovers.” Its deployment in this particular context could hardly be more apposite; the tragedy of a man driven to build and live up to a name that predicts his own downfall with a double entendre of twisted, malicious glee. There was a horrible inevitability to the fact that Anthony Weiner’s career in the US Congress would end in sexual scandal, but watching him try to rejuvenate his fortunes is fascinating. The mass media – who constantly punctuate the narrative, framing the experience for the film’s audience in much the same way as they did for the public at the time – opens proceedings with a potted history of the seven term Congressman provided by a cacophonous montage of appalled news anchors and barbs from late night TV hosts. In 2011 – just six months after the birth of his first son with wife and Hilary Clinton aide, Huma – Weiner was involved in an embarrassing ‘sexting’ scandal that led to his resignation. Two years later he plots his comeback via the 2013 New York mayoral election and his former assistant, Josh Kriegman is given incredible access to craft his fly-on-the-way account of it. 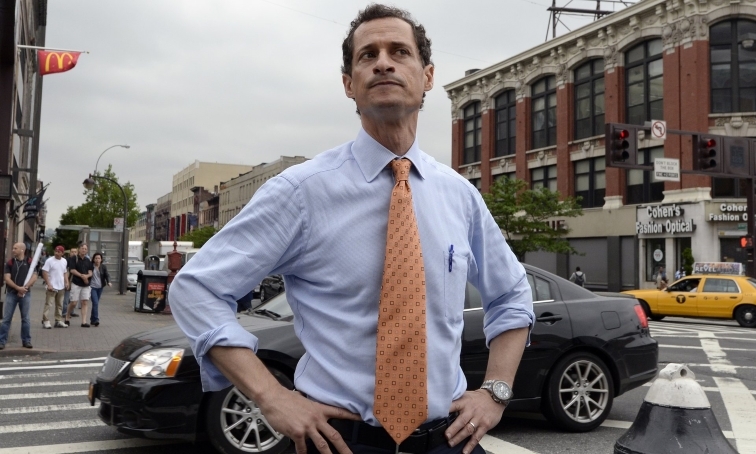 Weiner may now regret allowing such intimate things to be filmed – indeed he has publicly said that he won’t be watching the film – but Kriegman and co-director Steinberg have crafted a hugely lively and compelling portrait. It’s a sine wave of a campaign trail, with exhilarating peaks and humiliating troughs like some kind of Aaron Sorkin political drama – but it ultimately seems more likely to have been penned by Armando Iannucci as almost farcical humour is borne of a surprise lead in the polls being torpedoed by the candidate’s virtually unfaithful past. A scene in which he must sneak through the back of a MacDonald’s to his own event to avoid a grandstanding kiss-and-teller in the foyer is almost too much to believe. One can only imagine what Malcolm Tucker would have made of that. The filmmakers amplify the changes in the weather with an astutely adjusting rhythm. They are also well aware of the grey clouds looming in the distance and right from the off they allow the camera to linger on Huma as she seems to stare straight through her husband stony-faced. It undercuts the insistence on their survival as a couple after the betrayals of the past, but as much as this opens them up to questions of politicking, it convinces far more as an attempt by both to scale an impossible summit on nothing but sheer will. The judgements that must be made about image and career are always nagging in the background, though, with a regularly shifting undercurrents – of Weiner’s making – knocking them off their feet. Respect and trust are what Weiner desperately needs from the populace, but as the current begins to overpower him, it’s pity that is felt for a complex and charismatic anti-hero. As a Democrat Congressman he was beloved for his combative oratory and that gift has gone nowhere, but ultimately, this feels like a doomed filibuster. It’s time for gentleman to yield and Weiner is a brilliant backstage tour of why. Weiner is released in UK cinemas and on demand from this Friday. Visit weinermovie.com for more info.